Food is to Ethiopians as water is to fish. Eating is a relaxed, communal and celebrated experience. Food is always fresh, ingredients are organic and spices are used liberally. 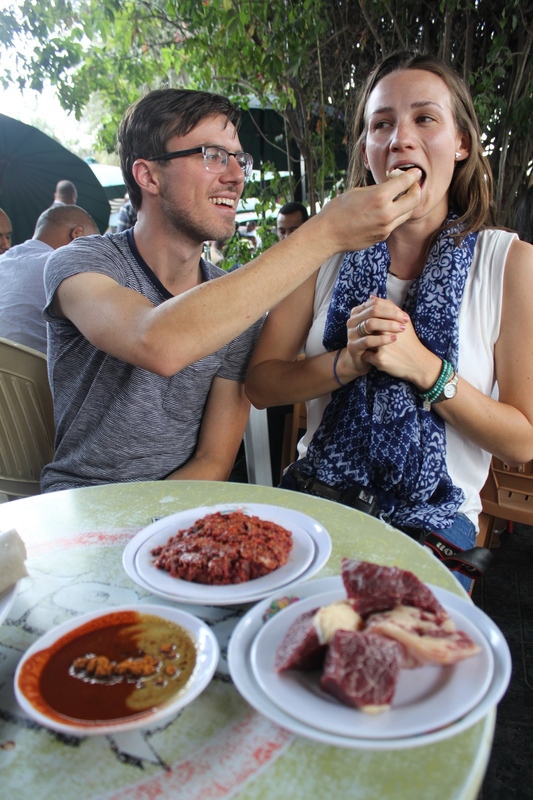 Meats, stews and vegetables are poured over a shared plate of injera, eaten by hand and enjoyed together. If people arrive on time, it’s not an authentic Ethiopian gathering. A lunch party scheduled for noon, means people start arriving at 1:30 and food is served almost an hour after that. However, while people can’t be counted on to show up on time, the food can be counted on to keep coming. And coming. 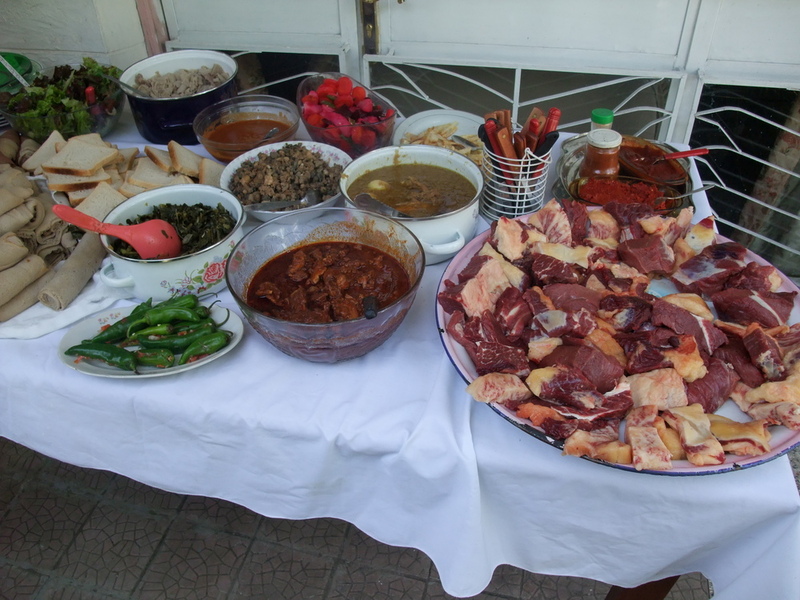 People start preparing food days before a gathering. Wot (Ethiopian stew – see our meat page here) takes about 3 hours to stew and countless others to prepare the ingredients beforehand. And it tastes better after it sits for a day or two. We once went to a lunch party where there were 10 different dishes on a buffet table and no more than 15 people. After we each had several servings from the buffet, we were treated to a coffee ceremony. And after that, strips of beef known as zilzil tibs were grilled up over an open fire – lunch round two. Ethiopians are like Jewish grandmothers on crack. These gatherings are certainly centered around food, but family is a close second. 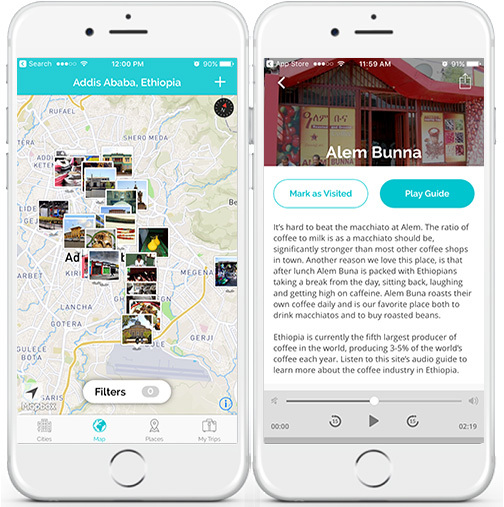 And in Ethiopia, if you are close friends, you’re considered family. People laugh, fight and retell stories from the old days. And food is used as a tool to gather people, with appreciation often shown through a gursha. A gursha is essentially a fistful of food, wrapped in injera and fed to you directly, meant as a demonstration of love. One gursha is never enough. It is always followed by a second, and then a third to symbolize the holy trinity, a mark the Ethiopian Orthodox tradition has left on the country’s modern food culture. 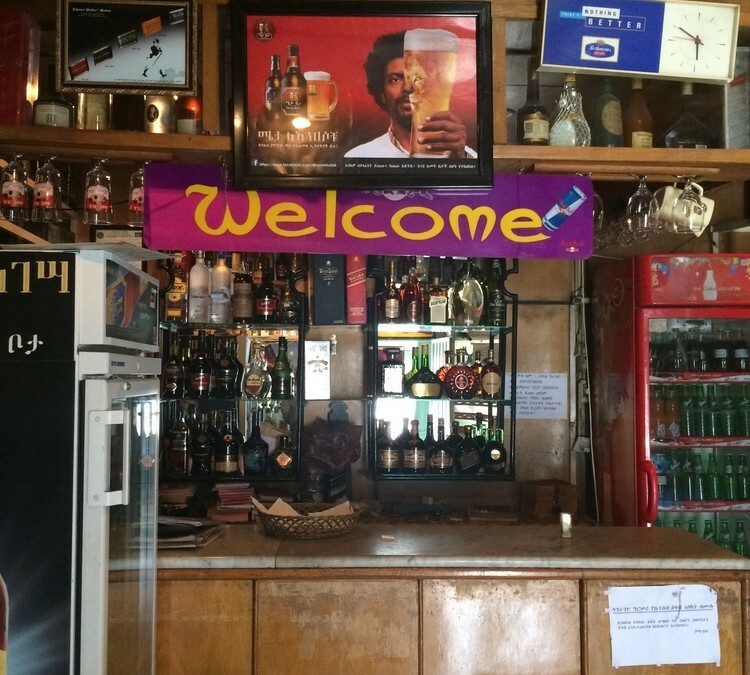 There are almost as many drink options as there are food options: water, Ambo (locally extracted sparkling water), beer, tej (local honey wine), tela (local beer), and scotch. If you’re not drinking, they’ll hassle you. But if you’re not eating, they’ll hassle you even more. And there are several ways to say ‘I’m full’ in Amharic. Know why? Because the first time you say it, no one believes you. ‘Tegebqu’ means ‘I’m satisfied’ and you can use it politely when someone brings around a serving of food. They won’t listen though and they’ll serve you some more anyways. You’ll have to eat it or everyone will make a fuss – they’ll ask if you don’t like the food or if you’re sick. The next time someone comes around you’ll say ‘becain’ which means ‘I’ve had enough,’ although this time you have to be a bit more forceful. They’ll continue to offer – but stay strong, put your hand over your stomach and keep insisting. Our newest strategy is to claim to be full when we’re really only about 50% full. That way, when the next couple of rounds are forced on upon you, you’ll still be able to stand at the end of the meal. Why are people like this? Perhaps its because there are hungry people just outside almost any door so food should never go to waste. 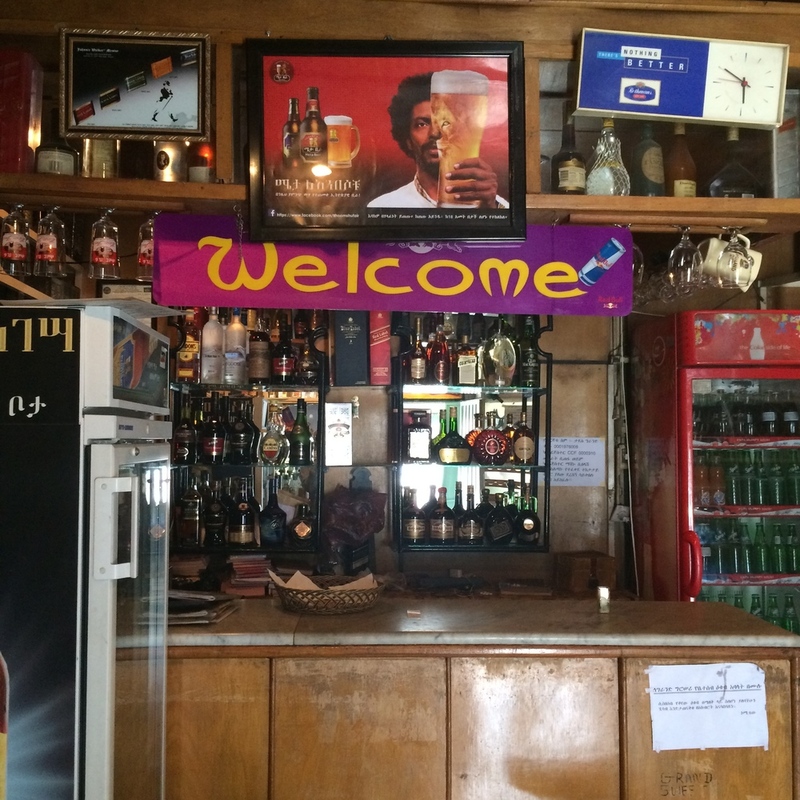 Regardless, Ethiopians are the most welcoming, friendly and hospitable people – they want you to have the best time and that includes the best eating experience.